Lenz’s Law is considered to be one of the basic laws in electromagnetic induction. We have discovered errors in the explanation of the Law, and suggest that the observed reduction in the rate at which a magnet falls inside a metal tube is not due to the induction of an opposing magnetic field, as previously believed. We propose that the reduced rate of the magnet’s fall is caused by the separation of electron-positron pairs inside the atom which reduces the rate of time flow inside the pipe, manifesting to the outside observer as a slowdown in motion. This interpretation is supported by other observations on the effects of static or pulsing magnetic fields on biological systems. 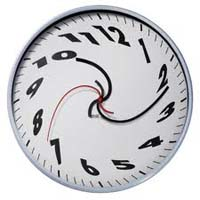 Time appears to be a magnetic phenomenon, and our discovery opens the path to the development of devices that could accelerate time or slow it down as desired.